Food Handler safety requirements are based on state and county regulations. 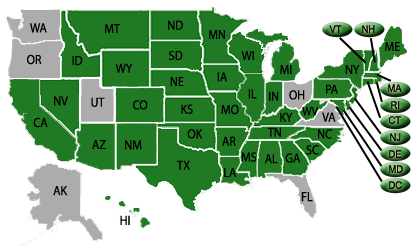 Click your state to determine if our course meets your state's food safety requirements for food handlers. As a food handler working in the food service industry, it is your responsibility to know safe food handling techniques and procedures. This online food safety for handlers course will teach you everything you need to know to be employed as a responsible food handler and award you an industry accepted certificate of completion from a leader in the food service industry and an ANSI Accredited Program Certificate Issuer - Accreditation Number 1185. The price of the Food Safety for Handlers course has been reduced for a limited time. Now is the time to take the online Food Safety for Handlers Course and get your food handler wallet card today! Click "Add to Cart" on the right or click your state on the map above to find more information about your state's requirements.